For as long as humans have dreamed, we’ve dreamed of flying. We’ve built machines to launch us into the heavens, ever aware that we’re merely visitors. 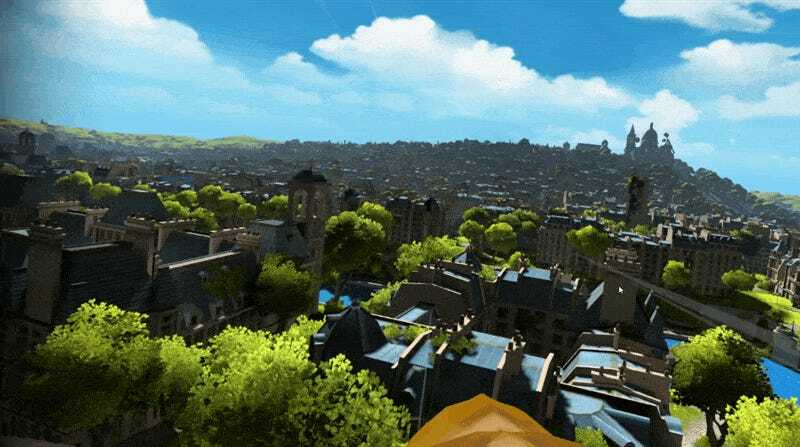 Reality falls short, but virtual reality brings us a bit closer in Ubisoft’s Eagle Flight. Eagle Flight takes place in a post-apocalyptic Paris. Nature is slowly reclaiming the city, pushing up through the concrete around the crumbling buildings and derelict vehicles. With humanity gone the animals roam free, zoo escapees and wild creatures converging to create a new ecosystem. Above it all, the eagles fly. Eagle Flight casts the player in the role of one of those majestic birds, soaring high in the sky over the Parisian ruins. The game features three basic modes. In campaign mode, players work their way through a series of missions, learning to fly, seeking out a mate, expanding their territory and defending it from the crows, bats and other contenders for stewardship of the skies. Eagle Flight’s campaign mode is fine for those seeking structure. The missions can be repetitive when tackled in quick succession, alternating between bird-based combat, flying through rings or navigating treacherous underground tunnels in what I imagine is very un-eagle-like fashion. Then there’s the competitive multiplayer mode, in which teams of up to three birds each aim to grab prey and return it to their nest before their rivals can grab it. It’s an exciting mode, dodging and weaving through ruined streets, shrieking at enemies to take them out, using a sonic-based shield to make it those last few yards to your nest. Teamwork is essential in larger matches. The only issue is the chance of getting into a larger match is rather slim at the moment. It’s the same with any VR multiplayer experience: The player base just isn’t there yet. Perhaps when it hits PlayStation VR next month or the Vive in December, but the best I could manage with my Rift was this two-on-two match. My favorite Eagle Flight game mode is Free Flight. Here the player can revel in the sensation of flight afforded by the game’s relatively intuitive control scheme. Many birds navigate by turning their heads—their heads tilt and turn, and the body follows suit. Eagle Flight’s head tracking is spot on, at least in the Rift version, making swooping through narrow streets and cramped spaces much easier than it looks. A controller is still required to speed up, slow down and implement natural-ish weapons during combat, but the navigation is purely head-tilting, and it comes very naturally. Eagle Flight’s main faults lie in the limitations of early virtual reality. There aren’t enough players currently to take advantage of the thrilling multiplayer mode. The graphics aren’t great, and the scenery can get quite repetitive. Story mode missions don’t vary much, and there are no checkpoints—running into a wall seconds before the end of a tunnel run starts the whole thing over. There’s a lot of room for improvement on many fronts. But for me it’s all about the flying. I’ve spent hours now lazily circling my way to the highest heights and then diving through the tree-choked lanes of wild Paris, so fast my vision blurs. I’ve taken turns so sharp it felt like I was going to fall from my real world perch. Eagle Flight is exactly the experience I wanted to have with virtual reality, and I can’t get enough. Also, I can’t get “Fly Like an Eagle” out of my head.